Irma Rombauer, the author of The Joy of Cooking, is prominently featured in a brief (and totally unnecessary) scene in Julie & Julia, where she passes on some important life lessons to Julia and her fellow cookbook authors. Irma Rombauer's Maid, however is barely featured at all in an even briefer (and even more unnecessary) segue into that scene. Oh man, that lady is old. I wonder if she even knows that she's in a movie. 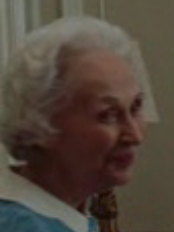 What if she was just an old lady they found with severe dementia walking around aimlessly at a local nursing home. Like, maybe she actually thought she was a maid in the 1960s--and not only a maid, but the maid for a famous cookbook author a.k.a. Mrs. Joy of Cooking. I am serious. She certainly looks a little demented. Irma Rombauer's Maid: A poor man's Betty White. Julie & Julia Quote of the Day: "The first edition of The Joy of Cooking took me a year to write."